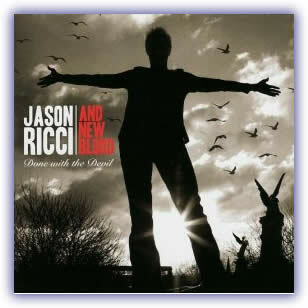 Just in time for spring is a new release from Jason Ricci and New Blood. Jason has become the heir-apparent to the throne of harmonica king over the last few years (although Dennis Gruenling is still in the running), and his talents are on full display on Done With The Devil. Jason is one of the hardest working musicians in the country, and it’s been great to see good things continue to come his way – he’s earned it through sheer hard work (sometimes enormous talent isn’t enough – but that usually takes sheer hard work, too.) This CD is the 2nd release for the band on Eclecto Groove Records (a subsidiary label of the Delta Groove blues/music concern), and with it the band continues to expand their sound. Where their previous CD, Rocket Number 9, was a darker, more rebellious affair, the new CD is brighter, and more accepting. It is still chock full of fire and passion, as would be any release from Jason and the band, and it is a treat for the ears – especially if those ears are connected to musically adventurous minds. If you’re stuck on 3 chords and a cloud of dust, you best move on. Shawn Starski has been Jason’s guitar foil for several years now. While he used to exist as almost a secret weapon for the band, that is definitely not the case anymore. Once you get featured in Guitar Player magazine your abilities have become very well known. Shawn has the ability to slip in to and out of many musical styles, always playing with great taste, tone and emotion, regardless of the style required by the song (hmm… playing to the song; what a novel idea…) Simply put, Shawn is the real deal! Bass man Todd “Buck Weed” Edmonds has been with the band a couple years now. He is a highly skilled player (jazz trained?) who has the ability to follow Jason and Shawn wherever they choose to go musically. I call him bass man because on this CD he plays electric bass, upright acoustic, sousaphone and even bass harmonica. Drummer Ed Michaels is the newest member of the band, joining in time to be able to record this CD with the band. He contributed one song, too, singing on it as well. Ed is also a player of great talents, and does an amazing job of supplying the beats to the wide array of song styles found on this CD. He works his backside off during a live show, that’s for sure! Speaking of live shows, Jason Ricci and New Blood are regular performers in St. Louis, having found a home away from home at B.B.’s Jazz, Blues & Soups. In fact, the band is scheduled to play there again on May 27, 2009. --The title song of the CD kicks things off with a jolt of rockin’ Mississippi Hill Country-influenced blues. If you took some Junior Kimbrough, then mixed it with some vintage Get Your Wings-era Aerosmith, you’ll have a very good idea of what this track sounds like. Jason spent a year or so as a young man living with and learning from the Kimbroughs, Burnsides, etc… and it’s actually nice to hear him mix some of this style into his recordings again. This just might be one of the coolest Aerosmith songs that Aerosmith never wrote. --The band is pretty firmly in jam-band territory here. That style isn’t one of my favorites in general, but that’s not to say that some of the songs aren’t a lot of fun. This is a long one (over 6 minutes), giving each of the band member to stretch out with some solo space. The tune is a little long and a little loose for my tastes, but Jason absolutely tears it up on harp. There couldn’t have been anything left of his harps but pieces when he finished this performance. --The tempo is brought way back down with this song, which is based on a slow bluesy riff. It’s got a bit of a Tom Waits feel, due to its melancholy mood and due to Jason’s vocal delivery. The lyrics sound very much autobiographical to Jason life, and to the lives of other men who have come out to the world-at-large as gay men. I haven’t yet mentioned the guitar playing of Shawn Starski, and I need to correct that right now. While he spends most of this tune chording, he throws a solo out there near the middle of the song that is simply stunning. --When was the last time you saw either of those words in a song title? The song itself is a sort of jazz-fusion excursion, and reminds me very much of some of the music performed by The Rippingtons, or maybe even some of Lee Oskar’s jazzier work. While it’s definitely jazzy in nature, there’s a pretty melody in place that never gets lost among the soloing. This sort of thing, if not performed well, can leave be kind of cold. However, the melody is solid, the playing phenomenal and the song structure tight. This tune will grow on you; I promise. --You turned into a what?! Wow, talk about a jarring juxtaposition of song styles… From the style of Tom Waits, to The Rippingtons, to a shot of punk rock a la The Misfits. The only thing going on here is a punk rock party (check all guns and knives at the door…), although played by incredibly skilled players. This is a cool track, and probably the most aggressive cut on the CD. Even so, it’s not really dark (probably due to the oh-oh-oh background vocals), at least not in comparison to many tracks on Rocket Number 9. --Its rare when New Blood performs a hard blues cover on a CD anymore, but that’s exactly what they do here, taking on this classic Willie Dixon tune. This cut is pure blues, with Jason blowing acoustic harp, Shawn playing Chicago-style blues guitar, and an organ gurgling along under it all. This was a treat for a blues-head like me. Thanks boys! --This is the 1st cut on the CD where Jason doesn’t handle the lead vocals. Guitarist Shawn Starski handles the vocals this time around, acquitting himself well. The song follows the lead of the previous tune, as it’s also firmly in the blues camp. This one is stripped down, played with acoustic instrumentation (including Dobro) in a delta blues vibe. --Life of Denial moves the band back into more familiar territory (familiar for the listener that is), motoring along a rockin’ bluesy road this time around. When Ricci really cuts loose on harp it sounds like he’s turning those things inside out (which he almost literally is when he starts overblowing). --Jason Ricci and New Blood take you on a jazzy instrumental excursion on this track. He plays the tune with only diatonic harmonicas, although he plays them chromatically via the extensive use of both bending and overblowing. Jason is an amazing technician on harp, as well as a very soulful player (the two traits do NOT always co-exist in the same player.) Listen carefully to this song in order to hear examples of his overblowing technique. Also, do not ignore Shawn Starski’s jazz-based guitar work. I enjoy bluesy jazz-styled guitar chording immensely (Kenny Burrell anyone? ), and Shawn shows off a few props here. This is a killer cut! Lee Howland - aka "East Side Slim"